The U.S. Embassy, through the U.S. Department of State sponsored a sub‑regional International Visitor Leadership Program (IVLP) professional exchange program focused on “Combating Corruption” from March 6 – 16, 2016. Supreme Court Judge, Justice Bernard Turner and Tribune reporter Khrisna Virgil represented The Bahamas in the program. Other countries represented included Guyana, Jamaica, and Suriname. 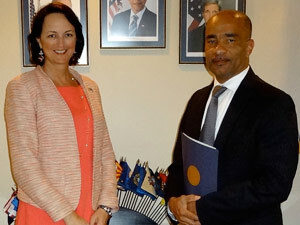 On March 31, Justice Turner and Ms. Virgil paid a courtesy call on U.S. Chargé d’Affaires a.i. Lisa Johnson at the U.S. Embassy to discuss their participation in the program. During the exchange, the participants visited Washington, D.C., Manchester, New Hampshire, and Raleigh, North Carolina. They explored the vital role of public/private partnerships and media in supporting good governance and discouraging corruption; examined the dynamics of political campaign financing and government procurement; learned best practices combating corruption; and looked at the mechanisms that enable citizens to foster good governance, ethical standards, and accountability at the local, state, and federal levels. U.S. Chargé d’Affaires a.i. 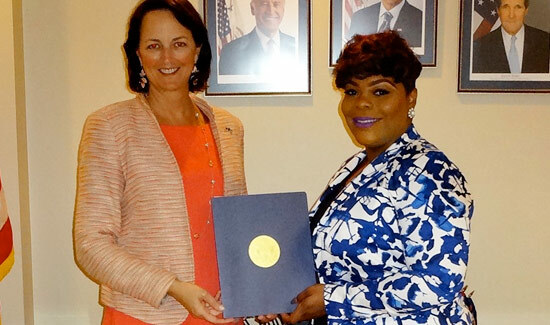 Lisa Johnson with Ms. Khrisna Virgil during courtesy call at the U.S. Embassy. U.S. Chargé d’Affaires a.i. Lisa Johnson with Justice Bernard Turner during courtesy call at the U.S. Embassy.